A cheap blood test can predict which apparently healthy patients are at high risk of a heart attack. 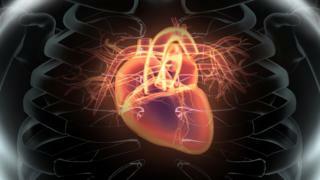 Experts say it could be better than just checking blood pressure and cholesterol to assess heart risk. So far, they have tested it only on men, but the British Heart Foundation-funded researchers say it should work in women too. The test, called troponin, looks for a protein released when the heart muscle is damaged. Doctors already use the same blood test to help diagnose men and women who they suspect have just had a heart attack. But researchers from Edinburgh and Glasgow universities say it should be used to help patients avoid ever reaching this point. In their study, Prof Nicholas Mills and colleagues found men who had higher levels of troponin in their blood were more likely to have a heart attack or die of heart disease up to 15 years later. But putting some of these high-risk men on preventive treatment, such as cholesterol-lowering drugs called statins, lowered their risk as well as their troponin levels. The 3,300 men in the study had high cholesterol but no history of heart disease. The scientists now plan to do more research involving women too. Prof David Newby, one of the authors of the study published in the Journal of the American College of Cardiology, said: "Troponin is almost like a barometer of heart health. If it creeps up, that's bad and your risk of heart problems increases. If it goes down, that's good. "It also appears to predict who benefits from statins and opens a door to a whole new way of testing." He said it could be a useful addition to measures like blood pressure readings and smoking status when building up a picture of someone's heart risk. Prof Mills said: "Troponin testing will help doctors to identify apparently healthy individuals who have silent heart disease so we can target preventive treatments to those who are likely to benefit most." Dr Tim Chico, a cardiologist from Sheffield University, said: "The problem with heart disease is that it remains very difficult to detect the early signs in people without symptoms, so these findings may provide a way to help identify people at risk. "Nevertheless, the best way to treat heart disease is to prevent it in the first place, and this is why a healthy diet, regular physical activity, not smoking, and maintaining a healthy weight and blood pressure is so important."